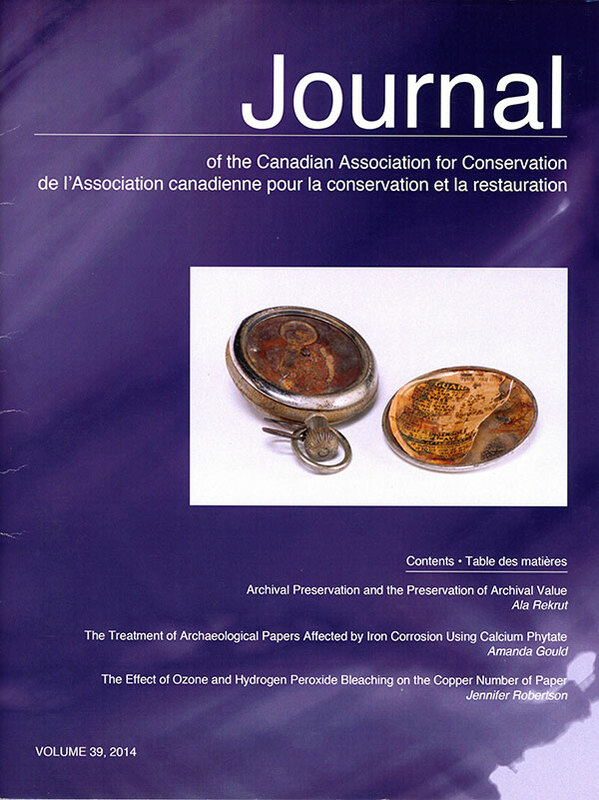 The Journal of the Canadian Association for Conservation (J.CAC) is the peer-reviewed journal of the Canadian Association for Conservation of Cultural Property (CAC). 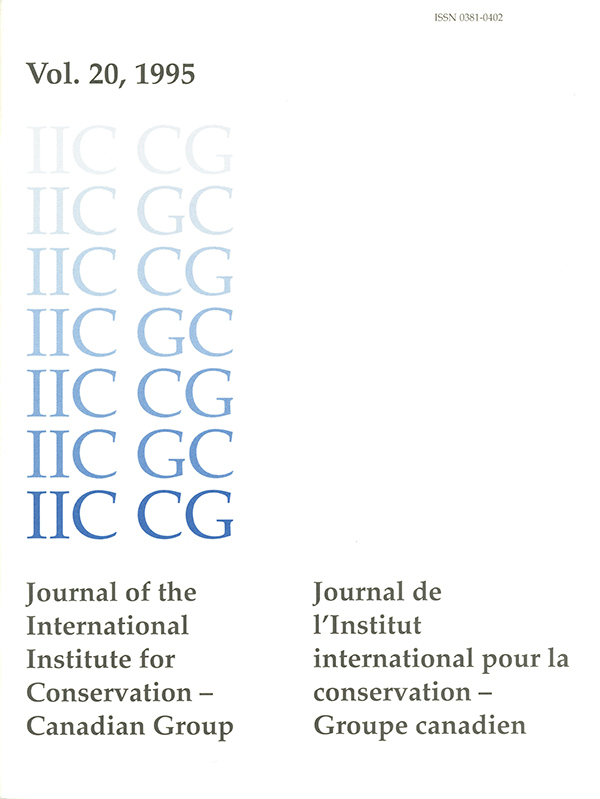 J.CAC superseded the Journal of the International Institute for Conservation – Canadian Group (J.IIC-CG) in 1997. 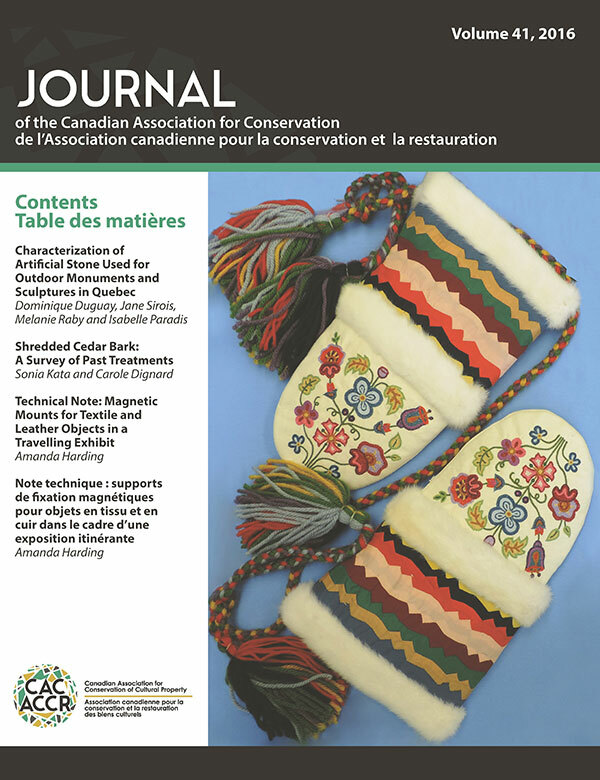 One volume is published each year, in both print and electronic format, bringing developments in conservation treatment, research, history and theory to our members and to the conservation field in Canada and internationally. To purchase single volumes of the JCAC, please contact the CAC Administrator: administrator@cac-accr.ca. Articles, notes, letters and book reviews are invited, written in English or French. Articles that record novel solutions to conservation problems (case histories) or original research in conservation methodology and material science, and conservation related artifact/art historical studies are especially welcome. Tutorial and review papers will be considered. Papers may be submitted at any time during the year. Manuscripts are normally between 2500 and 5000 words in length but shorter technical notes are also of interest. Manuscripts are reviewed for suitability, accuracy and originality by at least two referees with expertise in the topic addressed by the paper. The referees’ opinions will be used by the editors in deciding whether to publish the paper and whether content editing is required. Papers accepted for publication will be copy edited to meet J.CAC style requirements and to ensure correctness, consistency and completeness. The peer review and editing process generally takes a minimum of three to six months. Once final editing is complete, papers are published in the volume that is currently in preparation. Manuscripts submitted to the Journal for publication must not have been previously published elsewhere except in the form of a preliminary report, and must neither be under consideration nor in the process of publication with another publisher. Manuscripts should be submitted in electronic form to the Journal email address (journal@cac-accr.ca), ideally as Microsoft Word files. For the initial stage of peer review, adoption of J.CAC style, as described below, is highly encouraged but is not necessary as long as all required information is included and the manuscript is readable and well organized. Integration of figures and tables within the text is encouraged, but these will need to be submitted as separate files when papers are accepted for publication. Automatic formatting features, such as endnotes and page numbers, can be used in the initial manuscript but will need to be removed by the author(s) at the final editing stage. All manuscripts are reviewed for suitability and clarity on submission and may be returned for editing to meet minimum requirements, if necessary, prior to peer review. Papers accepted for publication will be edited to conform to J.CAC style as described below. We encourage authors to consider these style requirements when preparing their manuscripts. J.CAC editors will ensure that details of our publication style are fully met. Consult volumes published since 2016 for models of current style. A template based on J.CAC style that includes these guidelines is provided for download below. Title: Placed at the head of the manuscript, it should reflect contents accurately yet concisely. Author(s): List all persons who contributed to the content of the article in order of their contribution. Contact information: Include current institution or business, full postal address, and email address of all authors. Use superscripts linked to the authors’ names to indicate contact information for multiple authors. Abstracts: Summarize the purpose of the paper and major results obtained in a concise paragraph of 200 words or less. Incorporate as many keywords as possible to aid in online searches. Abstracts will be published in both English and French. Authors who can submit their abstract in both languages are encouraged to do so. Text: Use headings and subheadings (up to three levels) to give the paper structure. Most papers will have an Introduction (or Background) section at the beginning and a Conclusion that succinctly summarizes the entire paper at the end. Scientific research reports will usually include sections on Methods, Results and Discussion. Units and nomenclature: Use SI Units (http://www.bipm.fr/) and IUPAC (International Union of Pure and Applied Chemistry) chemical nomenclature (http://www.iupac.org/nomenclature). Tables: Number tables sequentially with Roman numerals and provide a title. In the text, Cite each table in the text using bold type (e.g., Table II) and describe its content and relevance. Figures: Number figures (e.g. photographs, graphs, diagrams or drawings, radiographs, micrographs) using Arabic numerals and cite them in the text using bold type (e.g., Figure 3). Provide an explanatory caption of one or two sentences for each figure that concisely describes each image independent from the text and that includes photo credit and permission for use of images where applicable. Related images may be grouped and referred to with number-letter combinations (i.e., 1A,1B). Once the submission has been accepted for publication, authors will be asked to submit individual figures as separate, high resolution digital files and to list figure captions on a separate page at the end of the article. Provide photographs as JPEG or TIFF files saved with minimal compression that permit good resolution when printed at 300 dpi. For example, a photograph printed to 3.5 x 2.5 inches requires a file that is 1050 x 750 pixels or roughly 2.5 MB. As an approximate guide, any JPEG files less than 400 kB are unlikely to be suitable for reproduction. Scale graphs and diagrams to a width of either 3.5 or 7.5 inches or submit them in a format (e.g. Excel file) that permits manipulation of overall size and fonts so that these can be modified to suit final layout. Diagrams or graphs submitted as image files should have a resolution of at least 600 dpi at the final reproduction size. Colour printing: The Journal encourages the use of colour in figures and tables and assists by sharing the cost of colour printing with authors. Authors will not be charged for colour in versions posted to the CAC website. Acknowledgements: Insert brief acknowledgements, if required, after the text. Materials: List materials referred to in a treatment or study in alphabetical order at the end of the text and after the acknowledgements, giving trade name, composition (if known), and manufacturer or local supplier with complete postal address, telephone number, and/or website URL. Appendices: Additional detailed information, such as precise methods or data tables, may be included as appendices. If more than one is used, number appendices sequentially with Roman numerals before the title. Cite each appendix in the text using bold type (e.g., Appendix I) and describe its content and relevance. Appendices may be inserted before or after references. Notes and References: Number end notes and references in sequence, using superscript Arabic numerals, according to the first mention of each in the text. Subsequent references to the same work may use the same number. Subsequent references to different pages of previously cited works should have a distinct number but may use a shortened reference listing author last name(s), summary title and page number(s). Examples below illustrate how to format typical references. Published sources should be favoured whenever possible, but electronic and unpublished sources may be used. If automatic end notes are used in the manuscript during peer review and subsequent editing, authors will be asked to replace these with superscript numerals and a numbered list of notes and references prior to layout. 1 Town, Harold and David P. Silcox, Tom Thomson: The Silence and the Storm (Toronto: McClelland and Stewart, 1977), p. 93. 2 Gettens, Rutherford J. and Elisabeth West FitzHugh, “Malachite and Green Verditer,” in: Artists’ Pigments: A Handbook of Their History and Characteristics, vol. 2, edited by Ashok Roy (Washington: National Gallery of Art, 1993), pp. 183-202. 3 Brunet, Jacques and Pierre Vidal, “Les œuvres rupestres préhistoriques: étude des problèmes de conservation,” Studies in Conservation, vol. 25, no. 3, 1980, pp. 97-107. 4 Villers, Caroline, Lesley Stevenson and Julia Sharp, “The Technique of Four 14th-Century Italian Paintings on Fabric Supports,” in: Preprints, 10th Triennial Meeting, ICOM Committee for Conservation, vol. 1, Washington, DC, 22-27 August 1993, edited by Janet Bridgland (Paris: ICOM Committee for Conservation, 1993), pp. 104-109. 5 Lechtman, H., “The Gilding of Metals in Pre-Columbian Peru,” in: Application of Science in Examination of Works of Art, Proceedings of the Seminar, 15-19 June 1970, edited by William J. Young (Boston: Museum of Fine Arts, 1973), pp. 38-52. 6 Eusman, Elmer, “Iron Gall Ink,” in: The Iron-gall Ink Website, <https://irongallink.org/>. Accessed January 2018. 7 Stanley, Ted, “A Tool for Pressure Sensitive Tape Removal: the AirPencil,” The Book and Paper Group Annual, vol. 17, 1998, <http://aic.stanford.edu/sg/bpg/annual/v17/bp17-16.html>. Accessed May 2017. 8 Klein and Sears, Petroglyphs Provincial Park: Site Preservation Feasibility Study (Toronto: Klein and Sears, Architects, 1983). Unpublished report. 9 Darcy, Sean (Archivist, National Archives of Canada), personal communication, April 2003. 10 Town and Silcox, Tom Thomson, pp. 99-101. Copyright of articles will be retained by the CAC with some exceptions. Authors are responsible for obtaining copyright permission for the use of images from secondary sources. The cost to authors of obtaining copyright permission may be partially subsidized by the Journal; authors are asked to submit a request and justification.